The papal tiara is a crown that was worn by popes of the Roman Catholic Church from as early as the 8th century to the mid-20th. It was last used by Pope Paul VI in 1963 and only at the beginning of his reign. The name "tiara" refers to the entire headgear, no matter how many crowns, circlets or diadems have adorned it through the ages, while the three-tiered form that it took in the 14th century is also called the triregnum, triple tiara, or triple crown. From 1143 to 1963, the papal tiara was solemnly placed on the pope's head during a papal coronation. The surviving papal tiaras are all in the triple form, the oldest being of 1572, and the others no earlier than 1800. A representation of the triregnum combined with two crossed keys of Saint Peter continues to be used as a symbol of the papacy and appears on papal documents, buildings and insignia. The papal tiara originated from a conical Phrygian cap or frigium. Shaped like a candle-extinguisher, the papal tiara and the episcopal mitre were identical in their early forms. Names used for the papal tiara in the 8th and 9th centuries include camelaucum, pileus, phrygium and pileum phrygium. A circlet of linen or cloth of gold at the base of the tiara developed into a metal crown, which by about 1300 became two crowns. The first of these appeared at the base of the traditional white papal headgear in the 9th century. When the popes assumed temporal power in the Papal States, the base crown became decorated with jewels to resemble the crowns of princes. The second crown is said to have been added by Pope Innocent III (1198–1216) as signifying both his spiritual and temporal power, since he declared that God had set him over kings and kingdoms, or by Pope Boniface VIII. 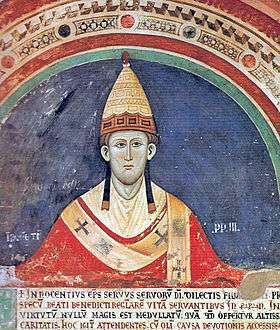 However, a fresco in the Chapel of Saint Sylvester (consecrated in 1247) in the church of the Santi Quattro Coronati in Rome seems to represent the Pope wearing a tiara with two bands and with lappets. The addition of a third crown is attributed to Pope Benedict XI (1303–1304) or Pope Clement V (1305–1314), and one such tiara was listed in an inventory of the papal treasury in 1316 (see "Tiara of Saint Sylvester", below). The first years of the 16th century saw the addition of a little globe and cross to top the tiara. The third crown was added to the papal tiara during the Avignon Papacy (1309–1378), giving rise to the form called the triregnum. After Pope Clement V at Avignon, various versions of the three-crown tiara have been worn by popes also in Rome down to Pope Paul VI, who was crowned with one in 1963. Under Boniface VIII (1294–1303) the hood of the regnum was lengthened and the circlet was greatly enriched with precious stones, while toward the end of his papacy a second circlet was added. The increased length had the symbolical meaning of dominion of the una sancta ecclesia over the earth, and demonstrated the meaning of the papal unam sanctum. In the inventory of 1295 the second year of Boniface's papacy the head-dress, which is now usually referred to as a tiara, is described as enriched with 48 rubies balas, 72 sapphires, 45 praxini or emeralds, numerous little balas rubies and emeralds and 66 large pearls. At the summit was a very large ruby. In the XIV century, the tiara of Boniface VIII began to be called the Tiara of St. Sylvester, and became venerated and considered as a relic. This was no doubt suggested by the Donation of Constantine, but it now came to be used only at the coronation of Popes, starting with Gregory XI in 1370 and his successor Urban VI in 1378. It was used at no other ceremonies and was kept in the Lateran Treasury. It was last used at the coronation of Nicholas V (1446–55), and in 1485 it was stolen and no more is heard of it". Twining also notes the various allegorical meanings attributed to the three crowns of the papal tiara, but concludes that "it seems more likely that the symbolism is suggested by the idea that took shape in the 13th and 14th centuries that the Emperor was crowned with three crowns--the silver crown of Germany at Aix-la-Chapelle, the iron crown of Lombardy at Milan or Monza and the golden imperial crown at Rome and therefore the Pope, too, should wear three crowns." Like a bishop's mitre, a papal tiara has attached to it two lappets, a pair of streamers or pendants that in Latin are called caudae or infulae. These are usually attached at the rear of the tiara, again as on a bishop's mitre, although the mosaic of Pope Clement VIII wearing a triregnum shows them placed forward of the ears. All extant tiaras have them placed at the rear. The 1911 Catholic Encyclopedia describes the lappets on a bishop's mitre as trimmed on the ends with red fringe. Pope Paul VI abandoned the use of the papal tiara at the Second Vatican Council, symbolically laying it on the altar of St. Peter's Basilica, and donating its value to the poor. However, his 1975 Apostolic Constitution Romano Pontifici Eligendo on the manner of electing the Pope, still envisaged that his successors would be crowned. The last Pope to be crowned was Paul VI in 1963, but after the solemn coronation ceremony he never used the tiara again and left his Successors free to decide in this regard. Pope John Paul I, whose memory is so vivid in our hearts, did not wish to have the tiara; nor does his Successor wish it today. This is not the time to return to a ceremony and an object considered, wrongly, to be a symbol of the temporal power of the Popes. Our time calls us, urges us, obliges us to gaze on the Lord and immerse ourselves in humble and devout meditation on the mystery of the supreme power of Christ himself. Though not currently worn as part of papal regalia, the continuing symbolism of the papal tiara is reflected in its use on the coats of arms of the Holy See and the flag of Vatican City. Until the reign of Benedict XVI the tiara was also the ornament surmounting a Pope's personal coat of arms, as a tasseled hat (under which a 1969 Instruction of the Holy See forbade the placing of a mitre, a second hat) surmounted those of other prelates. In a break with tradition, Pope Benedict XVI's personal coat of arms replaced the tiara with a mitre. This particular mitre contains three levels reminiscent of the three tiers on the papal tiara. 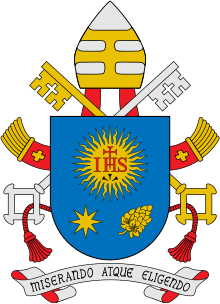 The mitre was retained on Pope Francis' personal coat of arms. However, in the coat of arms of the Holy See and of the Vatican City State the triple tiara is kept. See also Tiara of Pope Benedict XVI, made in Bulgaria and presented to Benedict XVI on 25 May 2011 by a group of German Catholics. As with previous popes, Pope Paul VI was crowned with a tiara at the papal coronation. As happened sometimes with previous popes, a new tiara was used, donated by the city of Milan, where he was Archbishop (and Cardinal) before his election. Quite different from earlier tiaras, it was not covered in jewels and precious gems, and was sharply cone-shaped. It was also distinctly heavier than the Palatine Tiara previously in use. At the end of the second session of the Second Vatican Council in 1963, Paul VI descended the steps of the papal throne in St. Peter's Basilica and ascended to the altar, on which he laid the tiara in a dramatic gesture of humility and as a sign of the renunciation of human glory and power in keeping with the renewed spirit of the council. Since then, none of his successors has worn a tiara. It was announced that the tiara would be sold and the money obtained would be given to charity; the tiara was in fact bought by Catholics in the United States and is now kept in the Basilica of the National Shrine of the Immaculate Conception in Washington, DC. It is on permanent display in Memorial Hall along with the stole that Pope John XXIII wore at the opening of the Second Vatican Council. Some Traditionalist Catholics considered highly controversial Pope Paul's abandonment of use of one of the most striking symbols of the papacy, the papal tiara, and continued to campaign for its reinstatement. Some indeed branded him an antipope, arguing that no valid pope would surrender the papal tiara. Among sedevacantist claimants to the papacy, at least one, Clemente Domínguez y Gómez, was crowned using a tiara, thus showing the power of its symbolism, while another, Lucian Pulvermacher, used the tiara on his coat of arms. Pope John Paul I dispensed with the 1000-year-old tradition of a papal coronation and the wearing of a papal tiara, deciding not to take advantage of the mention of a coronation in Pope Paul VI's 1975 Apostolic Constitution Romano Pontifici Eligendo, then in force: "Finally, the Pontiff will be crowned by the Cardinal Protodeacon and, within an appropriate time, will take possession of the Patriarchal Archbasilica of the Lateran, in accordance with the prescribed ritual." In a passage of his inauguration homily, quoted above, Pope John Paul II remarked that both his immediate predecessor and he himself had wished neither a coronation nor a tiara, and added: "This is not the time to return to a ceremony and an object considered, wrongly, to be a symbol of the temporal power of the Popes." When, in his 1996 Apostolic Constitution Universi Dominici gregis, he revised the rules on the election of Popes, he removed all mention of a papal coronation, replacing it with a reference to an "inauguration": "After the solemn ceremony of the inauguration of the pontificate and within an appropriate time, the pope will take possession of the Patriarchal Archbasilica of the Lateran, in accordance with the prescribed ritual." As in the Pope Paul VI's document, the phraseology is descriptive, not prescriptive. Besides, it lays down no rules about the form of the "ceremony of the inauguration of the pontificate", which could indeed take the form of a coronation. In any case, a Pope is not bound by ceremonial rules made by a predecessor, and may freely change them. Before the coronation of Pope Paul VI, coronations had fallen into disuse even in western countries that had kept a monarchical form of government, with the exception of the British monarchy (see Coronations in Europe). All others monarchs, like modern popes, are "inaugurated" into office. The triple tiara still featured as one of the ornaments on the personal coat of arms of Popes John Paul I and John Paul II, who never used the actual object. However, John Paul II gave his official approval later in his reign to depictions of his arms without the tiara, as with the mosaic floor piece towards the entrance of St Peter's Basilica, where an ordinary mitre takes the place of the tiara. The coat of arms of Pope Benedict XVI has replaced the tiara with a mitre: "Benedict XVI decided not to include the tiara in his official personal coat of arms. He replaced it with a simple mitre which is not, therefore, surmounted by a small globe and cross as was the tiara". Unofficially, the tiara was embroidered in the vestments he wore during the Mass in the Cathedral of Sydney during World Youth Day 2008 and in a gift tapestry hung from the window at which he recited the Angelus in October 2010. Each year, a small papal tiara is placed on the head of the famous bronze statue of Saint Peter in St. Peter's Basilica from the vigil of the Feast of the Cathedra of Saint Peter on 22 February until the Feast of Saints Peter and Paul on 29 June. This custom was not observed in 2006, but was reintroduced in 2007. Although often referred to as the Papal Tiara, historically there have been many, and twenty-two remain in existence. Many of the earlier papal tiaras (most notably the tiaras of Pope Julius II and that attributed to Pope Saint Silvester) were destroyed, dismantled or seized by invaders (most notably by Berthier's army in 1798), or by popes themselves; Pope Clement VII had all the tiaras and papal regalia melted down in 1527 to raise the 400,000 ducats ransom demanded by the occupying army of Holy Roman Emperor Charles V. Over twenty silver tiaras exist, of which the earliest, the sole survivor of 1798, was made for Pope Gregory XIII in the 16th century. On 21 March 1800 as Rome was in the hands of the French, Pius VII was crowned in exile, in Venice, with a papier-mâché tiara, for which ladies of Venice gave up their jewels. Many tiaras were donated to the papacy by world leaders or heads of states, including Queen Isabella II of Spain, William I, German Emperor, Emperor Franz Joseph I of Austria and Napoleon I of France. The tiara provided by the last was made from elements of former papal tiaras destroyed after the capture of Rome, and was given to Pius VII as a 'wedding gift' to mark Napoleon's own marriage to Empress Josephine on the eve of his imperial coronation. Others were a gift to a newly elected pope from the See which they had held before their election, or on the occasion of the jubilee of their ordination or election. 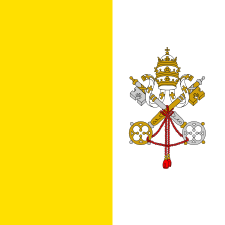 Flag of Vatican City. The arms on the flag, with a tiara, are the same as the papal arms, except that the positions of the gold and the silver keys are reversed. In some instances, various cities sought to outdo each other in the beauty, value and size of the tiaras they provided to popes from their region. Examples include tiaras given to Popes John XXIII and Paul VI, the former by John's home region, the latter by Paul's previous archiepiscopal see of Milan on their election to the papacy. Popes were not restricted to a particular tiara: for example, photographs on this page show Pope John XXIII, on different occasions, wearing the tiara presented to him in 1959, Pope Pius IX's 1877 tiara, and Pope Pius XI's 1922 tiara. Pope Paul VI, whose bullet-shaped tiara is one of the most unusual in design, was the last pope to wear a papal tiara (though any of his successors could, if they wished, revive the custom). Most surviving tiaras are on display in the Vatican, though some were sold off or donated to Catholic bodies. Some of the more popular or historic tiaras, such as the 1871 Belgian tiara, the 1877 tiara and the 1903 golden tiara, have been sent around the world as part of a display of historic Vatican items. Pope Paul VI's "Milan tiara" was donated to and is on display in the crypt church of the Basilica of the National Shrine of the Immaculate Conception in Washington, D.C., United States of America. Most of the surviving (three-crown) papal tiaras have the shape of a circular beehive, with its central core made of silver. Some were sharply conical, others bulbous. Except for that of Pope Paul VI, all were heavily bejewelled. The three crowns are marked by golden decorations, sometimes in the form of crosses, sometimes in the shape of leaves. Most are surmounted by a cross set above a monde (globe), representing the universal sovereignty of Christ. Each tiara had attached to the back two lappets; highly decorated strips of cloth embroidered with golden thread, bearing the coat of arms or another symbol of the pope to whom the tiara had been given. There are two rather unusual tiaras: the papier-mâché tiara made when Pope Pius VII was elected and crowned in exile, and the one made for Pope Paul VI in 1963, which is somewhat bullet-shaped, contains few jewels and, instead of being adorned by three coronets, is marked with three parallel circles and has a double-tiered crown at its base. 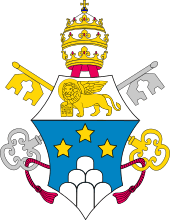 Coat of arms of Pope John Paul I: the tiara still appeared in papal arms, even when the tiara ceased to be worn. Except for the papier-mâché tiara, the lightest tiara was that made for Pope John XXIII in 1959. 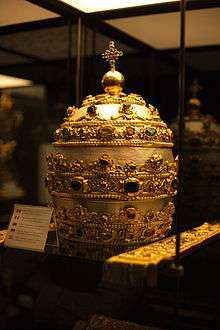 It weighed just over 0.9 kg (2 lb), as did the 1922 tiara of Pope Pius XI. In contrast, the bullet-shaped tiara of Pope Paul VI weighed 4.5 kg (10 lb). The heaviest papal tiara in the papal collection is the 1804 tiara donated by Napoleon I to celebrate both his marriage to Josephine and his coronation as French emperor. It weighs 8.2 kg (18.1 lb). However it was never worn, as its width was made, some suspected deliberately, too small for Pope Pius VII to wear. A number of popes deliberately had new tiaras made because they found those in the collection either too small, too heavy, or both. Rather than use the papier-mâché tiara, Pope Gregory XVI had a new lightweight tiara made in the 1840s. In the 1870s, Pope Pius IX, then in his eighties, found the other tiaras too heavy to wear and that of his predecessor, Pope Gregory, too small, so he had a lightweight tiara made also. In 1908 Pope Pius X had another lightweight tiara made as he found that the normal tiaras in use were too heavy, while the lightweight ones did not fit comfortably. New methods of manufacture in the 20th century enabled the creation of lighter normal tiaras, producing the 900 g (2 lb) tiaras of Pius XI and John XXIII. That, combined with the existence of a range of lightweight tiaras from earlier popes, meant that no pope since Pius X in 1908 needed to make his own special lightweight tiara. There is no certainty about what the three crowns of the Triple Tiara symbolise, as is evident from the multitude of interpretations that have been and still are proposed. Some link it to the threefold authority of the "Supreme Pontiff: Universal Pastor (top), Universal Ecclesiastical Jurisdiction (middle) and Temporal Power (bottom)". Others interpret the three tiers as meaning "father of princes and kings, ruler of the world, vicar of Christ". The words that were used when popes were crowned were: Accipe tiaram tribus coronis ornatam, et scias te esse patrem principum et regum, rectorem orbis in terra vicarium Salvatoris nostri Jesu Christi, cui est honor et gloria in saecula saeculorum ("Receive the tiara adorned with three crowns and know that thou art father of princes and kings, ruler of the world, vicar on earth of our Saviour Jesus Christ, to whom is honour and glory for ever and ever"). Yet others have associated it with the threefold office of Christ, who is Priest, Prophet and King, or "teacher, lawmaker and judge". Another traditional interpretation was that the three crowns refer to the "Church Militant on earth", the "Church Suffering after death and before heaven", and the "Church Triumphant in eternal reward". Yet another interpretation suggested by Archbishop Cordero Lanza di Montezemolo, who designed Pope Benedict XVI's tiara-less coat of arms, was "order, jurisdiction and magisterium", while a further theory links the three tiers to the "celestial, human and terrestrial worlds," which the pope is supposed to symbolically link. Lord Twining suggested that just as the Holy Roman Emperors were crowned three times as king of Germany, king of Italy and Roman emperor, so the popes, to stress the equality of their spiritual authority to the temporal authority of the emperor, chose to be crowned with a tiara bearing three crowns. The papal tiara was never worn for liturgical celebrations, such as Mass. At such functions the Pope, like other bishops, wore a mitre. However, a tiara was worn during the solemn entrance and departure processions, and one or more could be placed on the altar during the elaborately ceremonial Pontifical High Mass. The tiara was thus worn in formal ceremonial processions, and on other occasions when the pope was carried on the sedia gestatoria, a portable throne whose use was ended by Pope John Paul II immediately after his election in October 1978. His short-lived predecessor, John Paul I, also chose initially not to use it, but relented when informed that without it the people could not see him. The papal tiara was also worn when a pope gave his traditional Christmas and Easter Urbi et Orbi blessing ("to the City and the World") from the balcony of St Peter's – the only religious ceremony at which the tiara was worn. Pope John XXIII blesses the crowds after his coronation in 1958. He is wearing the 1877 tiara. 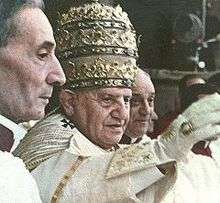 The most famous occasion when the triple tiara was used was the papal coronation, a six-hour ceremony, when the new pope was carried in state on the sedia gestatoria (portable throne – see image of Pope John XXIII, left), with attendants fanning the pontiff with ostrich-feathered flabella to the location of the coronation. Traditionally, coronations took place in St Peter's Basilica. Receive the tiara adorned with three crowns and know that you are Father of princes and kings, Ruler of the world, Vicar of our Saviour Jesus Christ. Pope Paul VI opted for a significantly shorter ceremony. As with all other modern coronations, the ceremony itself was only symbolic, as the person involved became Pope and Bishop of Rome the moment he accepted his canonical election in the papal conclave. The two subsequent popes (John Paul I and John Paul II) abandoned the monarchial coronation, opting instead for a coronation-less investiture. In 2005, Pope Benedict XVI took a step further and removed the tiara from his papal coat of arms, replacing it with a mitre. Agostino Veneziano's engraving of Suleiman the Magnificent. Note the four tiers on the helmet (which he had commissioned from Venice), symbolizing his imperial power, surpassing the 3-tiered papal tiara. 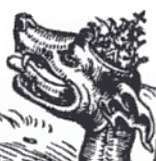 Lucas Cranach the Elder depicted the papacy as the Beast of Revelation wearing a papal tiara in Luther's 1522 translation of the New Testament. Only one other Catholic see uses the triple tiara in its coat of arms: the Patriarchate of Lisbon. The title of Patriarch of Lisbon was created in 1716 and is held by the archbishop of Lisbon since 1740. 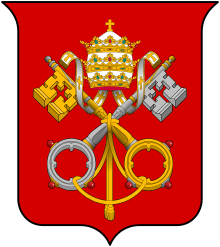 The coat of arms of the Holy See combines the tiara with the crossed keys of St. Peter, while that of the Lisbon Patriarchate combines it with a processional cross and a pastoral staff. Also the Archbishop of Benevento uses the tiara in its coat of arms. The 16th-century Ottoman Sultan Suleiman the Magnificent commissioned Venetian craftsmen to make a 4-tiered tiara modeled on the papal design, to demonstrate that his power and authority exceeded that of the Pope. This was a most atypical piece of headgear for an Ottoman sultan, which he probably never normally wore, but which he placed beside him when receiving visitors, especially ambassadors. It was crowned with an enormous feather. Conversely, the papal coronation ceremony, in which the Pope was fanned with flabella (long fans of ostrich feathers) and carried on the sedia gestatoria (portable throne), was based on the Byzantine imperial ceremonies witnessed in medieval Constantinople. Medieval tarot cards included a card showing a woman wearing a papal tiara and known as the Popess or Papess or the High Priestess. The meaning and symbolism of the card is uncertain. The crowned woman has variously been identified as Pope Joan (a woman who according to a medieval and later Protestant legend had disguised herself as a man and been elected pope; some cards also show a child, and the Pope Joan legend pictured her as found out when she gave birth during a papal procession), as Mary, Mother of God, or even as Cybele, as Isis, or as Venus. Cards with a woman wearing a papal tiara, produced during the Protestant Reformation, and apparent images of "Pope Joan" and her child, have been seen as a Protestant attempt to ridicule the office of the papacy and the Catholic faith. The papal tiara, however, disappeared from later depictions of the High Priestess/Popess, and showed her wearing more standard medieval female headgear. All tarot cards also contain a representation of the pope, known as The Hierophant, in some cases crowned with a papal tiara. For instance, the Rider-Waite tarot deck, currently the widest-circulated deck in existence, depicts The Hierophant or pope as wearing a papal tiara and carrying a papal cross. ↑ "tiara – papal dress". Encyclopedia Britannica. 1 2 3 4 5 "Herbert Norris, ''Church Vestments'' (Dutton 1950, republished by Dover Publications 2002 ISBN 0-486-42256-9), pp. 108–115". Google.com. Retrieved 2013-05-18. ↑ "''Encyclopaedia Britannica'', article "tiara (papal dress)"". Britannica.com. Retrieved 2013-05-18. 1 2 "TIARA (Gr. -papa)". jrank.org. ↑ "Pope St. Sylvester, December 31". Traditioninaction.org. Retrieved 2010-05-02. 1 2 "Sala Stampa della Santa Sede: "Storia della Tiara"". Vatican.va. Retrieved 2013-05-18. ↑ Edward Twining. A History of the Crown Jewels of Europe, (London: B. T. Batsford, 1960) pp. 377-378. 1 2 "Homily of His Holiness John Paul II for the inauguration of his pontificate, 4". Vatican.va. 1978-10-22. Retrieved 2013-05-18. ↑ Secretariat of State, instruction "Ut sive sollicite", 28, in Acta Apostolicae Sedis 61 (1969) 334-340 (English translation in L'Osservatore Romano, 17 April 1969): "The use of the crozier and mitre in the coat-of-arms is suppressed." ↑ "(archived)". Web.archive.org. Archived from the original on 8 November 2004. Retrieved 2013-05-18. 1 2 "Pope Paul VI Tiara". Andrejkoymasky.com. Retrieved 2013-05-18. ↑ "Traditionalist Catholic website criticising Benedict XVI's non-use of the papal tiara". Dailycatholic.org. 29 April 2005. Retrieved 2010-05-02. ↑ "Anti-Pope Paul VI Smashing the Sacred Papal Tiara". Opusdeialert.com. Retrieved 2013-05-18. ↑ "Take a Step to Your Future Success!". truecatholic.us. ↑ Romano Pontifici Eligendo (1975), 92. ↑ Universi Dominici gregis (1996), No. 92. 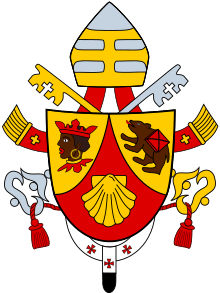 ↑ "Coat of Arms of His Holiness Benedict XVI". Vatican.va. Retrieved 2013-05-18. ↑ "Catholic News Service, A papal crown makes for not-quite-perfect gift". Cnsblog.wordpress.com. Retrieved 2013-05-18. ↑ "Image of this tiara provided by the Holy See Press Office". Vatican.va. Retrieved 2013-05-18. ↑ Designed by Ambrogio Foppa with a massive cost of 200,000 ducats, one third of the papacy's annual income, at a time when a parish priest was paid 25 ducats a year. ↑ To give a comparison in weights, St. Edward's Crown, with which British monarchs are crowned, weighs only 2.15 kg (4 lb 12 oz). Yet Queen Elizabeth II after her coronation commented how the crown "does get rather heavy". Similarly King George said after the Delhi Durbar in 1911 how the Imperial Crown of India "hurt my head as it is rather heavy". Yet both these crowns are lighter than most papal tiaras, and less than a third of the weight of the 1804 tiara given to Pius VII by Napoleon. Gyles Brandreth, Philip & Elizabeth (Century, 2004) p.311. and "The Crown Jewels" published by the Tower of London. ↑ "Tu Es Petrus". Ewtn.com. Retrieved 2010-05-02. ↑ "Francis Patrick Henrick, ''The Primacy of the Apostolic See Vindicated'' (Baltimore, London and Pittsburgh 1857), p. 252". Google.com. Retrieved 2013-05-18. ↑ According to the Encyclopaedia Americana, article "Tiara", the words were "… scias te esse patrem, principem et regem …" (know that you are a father, a prince and a king). ↑ "The Holy See". Ewtn.com. Retrieved 2010-05-02. ↑ "Website on pre-Vatican II liturgical and ecclesiastical vestments and symbols". Memorare.com. Retrieved 2010-05-02. ↑ "The Coronation". ElectAPope.Com. Retrieved 2010-05-02. ↑ "CNS STORY: Pope drops papal crown from coat of arms, adds miter, pallium". Catholicnews.com. Retrieved 2010-05-02. ↑ "Vatican flag: redirect to the right page". Users.skynet.be. Retrieved 2010-05-02. ↑ Twining, Lord Edward Francis (1960). A History of the Crown Jewels of Europe, B.T. Batsford Ltd., London, England. ↑ Like the papal tiara, the sedia gestatoria could be restored to use at any time. However, when Pope John Paul II's mobility became impaired, he opted not to be carried on men's shoulders, but instead to use a wheeled dais. This was criticized, because he could not easily be seen when sitting on it. ↑ "Horace Kinder Mann, Johannes Hollnsteiner, ''The Lives of the Popes in the Early Middle Ages'' (K. Paul, Trench, Trübner, 1906), vol. 3, p. 12". Google.com. Retrieved 2013-05-18. ↑ The Metropolitan Museum of Art. 1968. "Turquerie." The Metropolitan Museum of Art Bulletin, New Series 26 (5): pp. 229. ↑ Propaganda and Persuasion by Garth Jowett and Victoria and O'Donnell. ↑ Bruno Heim, Heraldry in the Catholic Church, Humanities: 1978, (ISBN 0-391-00873-0), p.52, 94. ↑ "Iconography of the pope cards". Tarot.com. 2012-11-21. Retrieved 2013-05-18. Bernstein, Carl; Politi, Marco (1996). His Holiness: John Paul II and the Hidden History of our Time. New York: Doubleday. ISBN 0-385-40538-3. Cornwell, John (1999). Hitler's Pope: The Secret History of Pius XII. New York: Viking. ISBN 0-670-87620-8. Cornwell, John (1989). A Thief in the Night: The Death of Pope John Paul I. London: Viking. ISBN 0-670-82387-2.
de Cesare, Raffaele (1909). The Last Days of Papal Rome 1850–1870. London: A. Constable. Davis, Raymond (ed.) (2000). The Book of Pontiffs (Liber Pontificalis). Liverpool: Liverpool University Press. ISBN 0-85323-545-7. Duffy, Eamon (1997). Saint & Sinners: A History of the Popes. New Haven, Conn.: Yale University Press. ISBN 0-300-07332-1. Hales, E.E.Y. (Edward Elton Young) (1954). Pio Nono: A Study in European Politics and Religion in the Nineteenth Century. London: Eyre & Spottiswoode. Hebblethwaite, Peter (1978). The Year of Three Popes. London: Collins. ISBN 0-00-215047-6. Hebblethwaite, Peter (1993). Paul VI : The First Modern Pope. New York: Paulist Press. ISBN 0-8091-0461-X. Hebblethwaite, Peter (2000). John XXIII: Pope of the Century. London: Continuum. ISBN 0-8264-4995-6. Heim, Bruno (1978). Heraldry in the Catholic Church: Its Origins, Customs and Laws. Gerrards Cross, Eng. : Van Duren. ISBN 0-905715-05-5. Hobsworth, Dean (1884). From True Cross to True Crown: Papalism and Its Evils. Levillain, Philippe (ed.) (2002). The Papacy: An Encyclopedia. New York: Routledge. ISBN 0-415-92228-3. Nielsen, Fredrik Kristian (1906). The History of the Papacy in the XIXth Century. London: J. Murray. Noonan, James-Charles. (1996). The Church Visible: The Ceremonial Life and Protocol of the Roman Catholic Church. New York: Viking. ISBN 0-670-86745-4. Rudé, George F. E. (2000). Revolutionary Europe, 1783–1815. Oxford: Blackwell. ISBN 0-631-22189-1. Smith, Uriah (1881). Thoughts, Critical and Practical on the Book of Revelation. Battle Creek, Mich.: Seventh-day Adventist Publ. Assoc. ISBN 0-8370-5309-9. Smithe, Jefferson (1902). Roman Catholic Ritual. London. Willey, David (1992). God's Politician: John Paul at the Vatican. London: Faber and Faber. ISBN 0-571-16180-4. Yallop, David A. (1984). In God's Name: An Investigation into the Murder of Pope John Paul I. Toronto: Bantam Books. ISBN 0-553-05073-7. Wikimedia Commons has media related to Papal tiaras. Herbermann, Charles, ed. (1913). "Tiara". Catholic Encyclopedia. New York: Robert Appleton Company.